Bogra (Bengali: বগুড়া) is a major city located in the Bogra District, Rajshahi Division, Bangladesh, and acts as the major commerce hub in the Bogra District. Described by some as the "nerve centre of Northern Bangladesh", Bogra is a bridge between the Rajshahi Division and Rangpur Division. The city area of Borga is approximately 72.5 km2 (27.99 sq mi), consists of 21 wards, and has a population of around 780,000 people.The city is famous for it's many ancient buddhist stupas, hindu temples and ancient palaces of Buddhist Kings and Muslim sultans as it is the oldest city in Bengal, the cuisine of Bogra is famous for its extravagant array of desserts and its renown Mishti doi and a major hub of politics producing the President Muhammad Ali Bogra of Pakistan, President Ziaur Rahman of Bangladesh, First Lady and First Female Prime Minister of Bangladesh Khaleda Zia all were born or have lived in the city. Currently the mayor of the municipality is Adv. 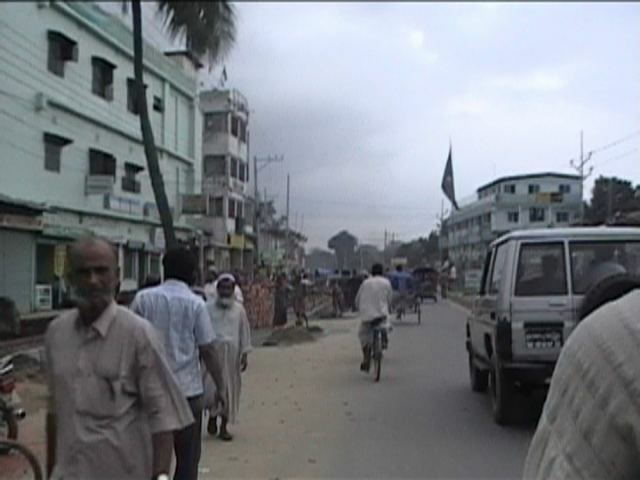 Mahabubar Rahman. Supposedly the oldest city of Bengal in the Great Emperor Ashoka's India, Emperor Ashoka conquered the Bengal (Bongo) and founded Borgra, previously called Pundra Bardhan. Possibly confirming this origin story, an ancient engraved stone believed to be of Gupta era was discovered on a pond bank near Sura Masjid at Ghoraghat Upazila in Dinajpur in October 2008. During the Bangladesh War of Independence, the area witnessed the Battle of Bogra a fierce battle between the guerrilla units of the BDF under Sector 7 which defeated the Pakistan Army. Bogra is named after Nasiruddin Bughra Khan. He was the son of Delhi Sultan Ghiyasuddin Balban. He was the Governor of Bengali from 1279 to 1282. First formed in 1821, the administrative district of Bogra contains an area of 1,359 sq mi (3,520 km2). The principal rivers in the district are formed by the different channels of the Brahmaputra, which river here bears the local names of the Konai, the Daokoba and the Jamuna, the last forming a portion of the eastern boundary of the district. The Brahmaputra and its channels, together with three minor streams, the Bangali, Karatoya and Atrai, allow for significant facilities for the usage of commerce. In 1911 the Karatoya (which flows from north to south), divided the district into two portions, the eastern tract consisting of rich alluvial soil, subject to fertilizing inundations and yielding heavy crops of coarse rice, oil-seeds and jute, while the soil of the high-lying western portion of the district allow for growing rice. Since 2009 with the advancment of urban planning, there has been a significant development in the infrastructure of Borgra including, restructured and widened town roads, improved telecommunications, and the instillation of underground gas connections. Additionally, red chili production in Bogra has become a major local industry, with companies such as Square, Acme, BD Food collecting red chili from as many as 12 centers withinBogra. 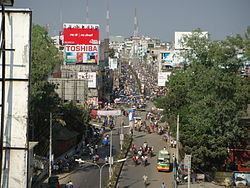 Often called the "Town of Banks", Bogra is the location of numerous online banking facilities, credit card, debit card, and money gram companies. Banking in Bogra has significantly expanded with the branch of government banks such as the Bangladesh Bank (Central Bank), Sonali Bank, Rupali Bank, Janata Bank, Rajshahi Krishi Unnayan Bank, Bangladesh Development Bank Ltd., Uttara Bank Ltd, Agrani Bank, as well as a number of private and specialized banks including, Pubali Bank, National Bank, IFIC bank Ltd., Citi Bank Ltd., and others. Additionally, Bogra is the home of IT, software, technology, and computer services companies, and in 2008 the French Grameen Group and Groupe Danone entered into a joint venture named Grameen Danone in Bogra. Statistically, Bogra's workforce is divided between jobs in agriculture (29.95%), agricultural manufacturing (12.53%), general commerce (18.11%), customer service (15.62%), transportation (6.66%), wage labor (2.2%), and other industries (14.93%). 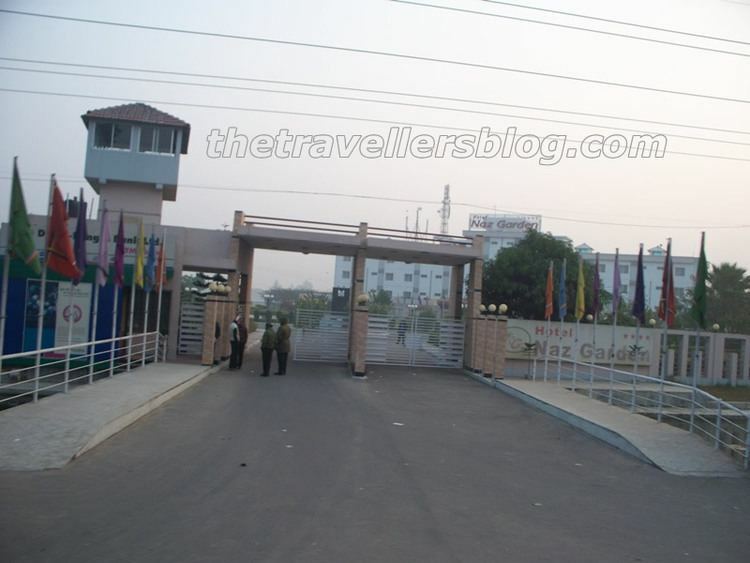 There is a some railway staitions and some bus terminals in Bogra. Borga is home to Mahasthangarh, the earliest urban archaeological site so far discovered in Bangladesh, as well as the village Mahasthan in Shibganj thana of Bogra District, which contains the remains of Pundranagara (or Paundravardhanapura), an ancient city in the territory of Pundravardhana. This place is considered to be sacred by Buddhists, Muslims and Hindus alike. Also popular among tourists to Bogra is the Behular Bashor Ghor which is very near to Mahasthangar, Nawab Palace (called Neelkuthi during the British period), Kherua Mosque (Sherpur Upazila), Bara Mosque, Mazar of Shah Sultan Balkhi, Mazar of Panchpir, Gokul Medh, palace of Parshuram, Basu Bihara, Palli Unnayan Academy, Saudia City Park, Bhimer Jangle, museum of Nawab Bari Palace, Wonderland Shishupark (children park), Shanewaz Shishubagan, Woodburn Park, Dreshtinandan Park, Bijayangan (war of liberation museum) and the Jaina Temple. Khademul Bashar (1935–1976), Bir Uttam, Sector Commander of Liberation War & former Chief of Bangladesh Air Force.